Morris & Co side cabinet. A rare walnut Arts & Crafts compact side cabinet of very good colour, by Morris & Co c1900. 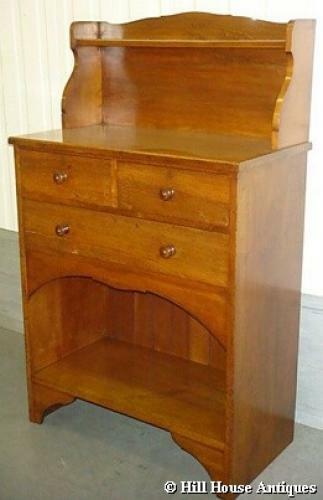 Shaped back and side rails with upper shelf and two short drawers above one long one, the whole on shaped bracket feet. Boarded back. Shaped recess lower half. Stamped to one drawer with Morris & Co, 449 Oxford St and design number. Possibly by WAS Benson to earlier Ford Maddox Brown designs. Approx 31" wide, 16.5" depth and 51" high. Equally useful as a hall piece, serving buffet or bookcase/cabinet unit.